WTZ map is divided into 20 segments. Click on the map for larger Time Zone image. Change Time mode: 12 hours (AM/PM) or 24 hours. World with Pacific Centered Time Zone Map. Layer 1 of 3-D Mouse Pad. +/- UTC Greenwich Mean Time Map. Layer 2 of 3-D Mouse Pad. 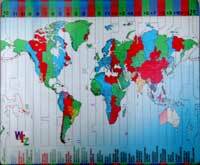 Daylight Saving Countries & Territories Map.